The share of U.S. adults who say they use certain online platforms or apps is statistically unchanged from where it stood in early 2018 despite a long stretch of controversies over privacy, fake news and censorship on social media, according to a new Pew Research Center survey conducted Jan. 8 to Feb. 7, 2019. Facebook – which recently celebrated its 15th anniversary – remains one of the most widely used social media sites among adults in the U.S. Roughly seven-in-ten adults (69%) say they ever use the platform. (A separate 2018 Center survey showed Facebook use among U.S. teens had dropped in recent years.) YouTube is the only other online platform measured that matches Facebook’s reach: 73% of adults report using the video sharing site. But certain online platforms, most notably Instagram and Snapchat, have an especially strong following among young adults. As was true in previous surveys of social media use by the Center, there are substantial age-related differences in platform use. This is especially true of Instagram and Snapchat, which are used by 67% and 62% of 18- to 29-year-olds, respectively. Particularly for these two platforms, there are also pronounced differences in use within the young adult population. 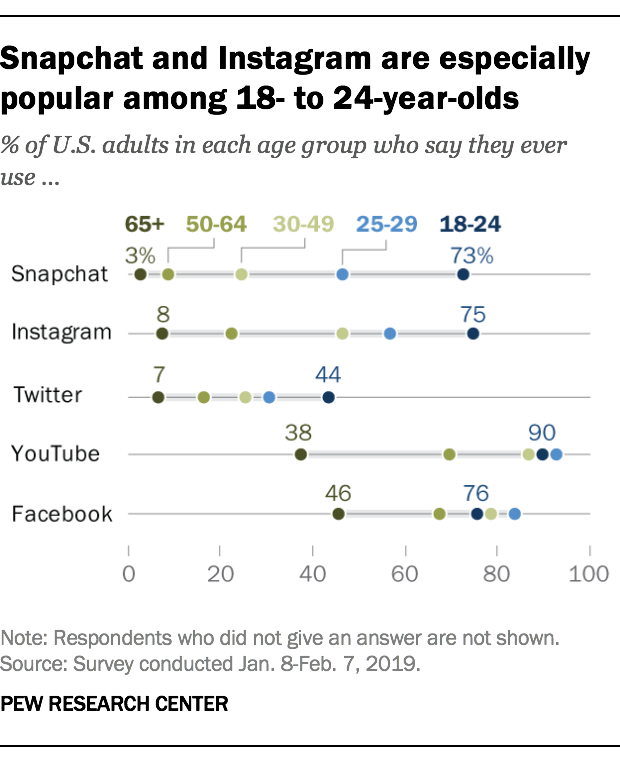 Those ages 18 to 24 are substantially more likely than those ages 25 to 29 to say they use Snapchat (73% vs. 47%) and Instagram (75% vs. 57%). By comparison, age differences are less pronounced for Facebook. 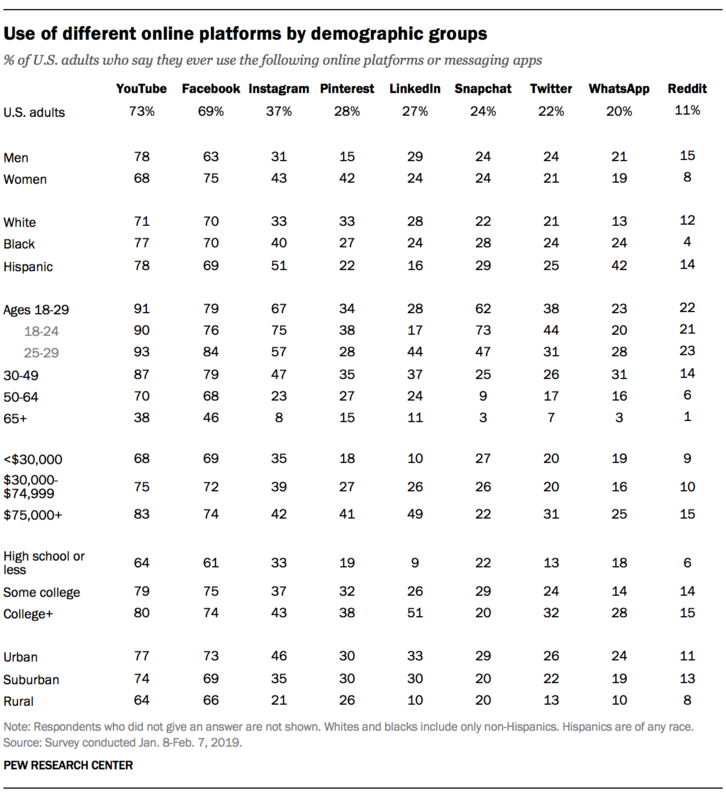 Facebook use is relatively common across a range of age groups, with 68% of those ages 50 to 64 and nearly half of those 65 and older saying they use the site. A 2018 Center survey found that some Facebook users had recently taken steps to moderate their use of the site – such as deleting the Facebook app from their phone or taking a break from the platform for some time. But despite these findings and amid some high profile controversies, Facebook users as a whole are just as active on the site today as they were a year ago. Roughly three-quarters of Facebook users (74%) visit the site daily, including about half who do so several times a day. These shares are identical to those reported by Facebook users in the Center’s 2018 social media use survey. 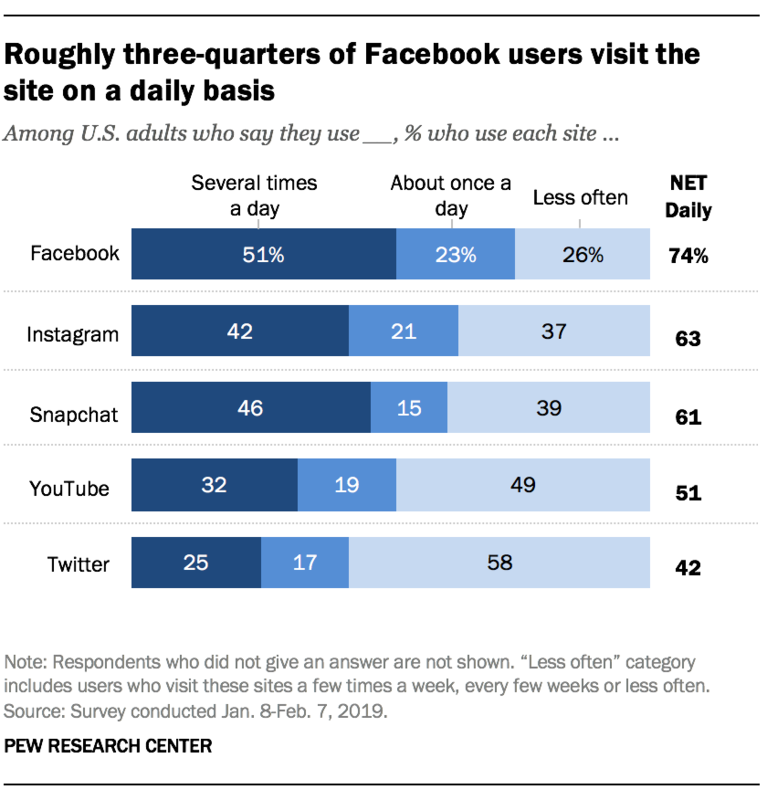 Majorities of Snapchat and Instagram users also say they visit these sites daily, though they are slightly less likely than Facebook users to do so. 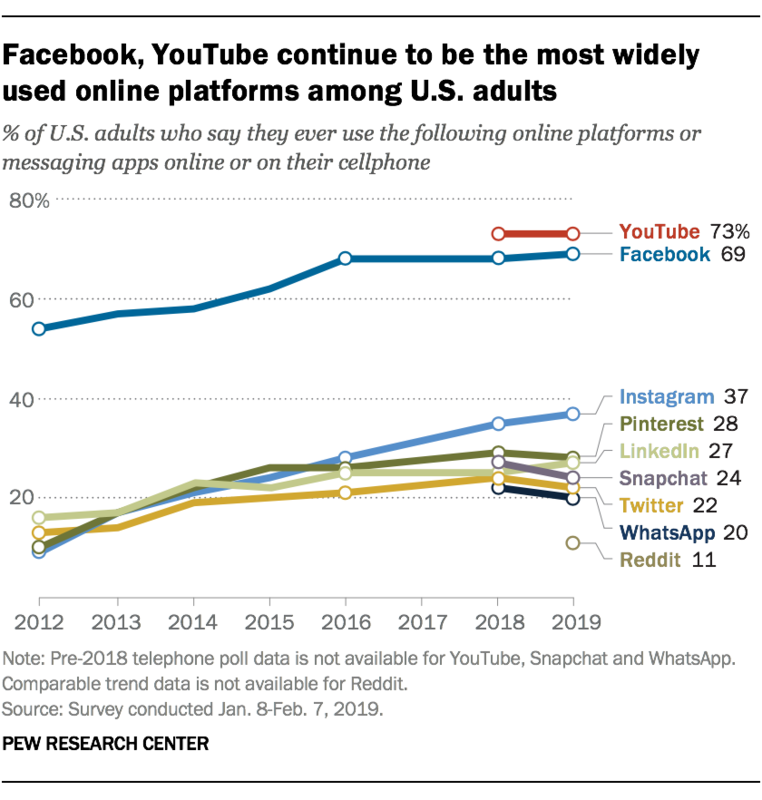 The shares of young adults using these platforms daily are especially large. Roughly eight-in-ten Snapchat users ages 18 to 29 (77%) say they use the app every day, including 68% who say they do so multiple times day. Similarly, 76% of Instagram users in this age group visit the site on a daily basis, with 60% reporting that they do so several times per day. These patterns are largely similar to what the Center found in 2018. Other platforms are visited somewhat less frequently. Some 51% of YouTube users say they visit the site daily – a slight increase from the 45% who said this in 2018. Andrew Perrin is a research analyst focusing on internet and technology at Pew Research Center.